Included among life’s many great recipes for disaster, are individuals who’s BQ (Bravado Quotient) way exceeds their IQ (Intelligence Quotient). Those who suffer from this infliction are destined to suffer for it and more often than not, are doomed to pay the ultimate price. One such character was Wayne Roth, 38, formerly of Pittston Pennsylvania. Wayne was bitten by a cobra belonging to his friend, Roger Croteau, after playfully reaching into the tank and picking up the snake. Wayne subsequently refused to go to a hospital, telling Roger, "I'm a man, I can handle it". Falser words have seldom been spoken. Instead of a hospital, Wayne reported to a bar. He had three drinks, and enjoyed bragging that he had just been bitten by a cobra. 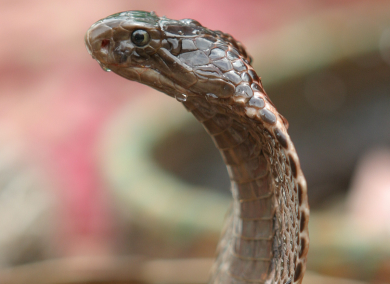 Cobra venom is a slow-acting central nervous system toxin. He died within a few hours, in Jenkins Township, Pennsylvania. Animal lovers will be pleased to know, the snake suffered no reported side effects.